This language arts poster is one of a set of 12 posters that explain the different forms of poetry. 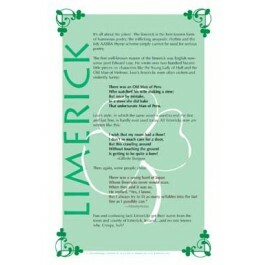 This poster explains the rules of a limerick and talks about the first well-known master of the limerick, English poet Edward Lear. The poster features one of Lear's whimsical limericks as well as two other amusing examples of this entertaining poetry form. 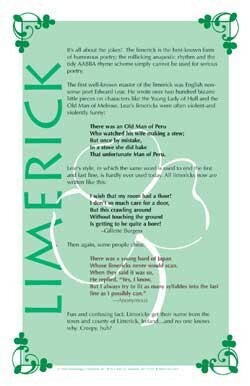 And, for a fun fact: Limericks got their name from the town and county of Limerick, Ireland, but no one knows why!